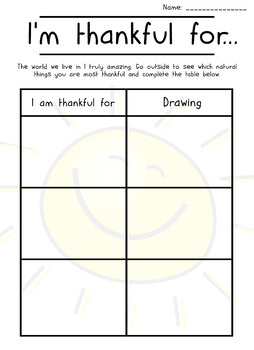 Take Thanksgiving into the outdoors with this reflective activity where your class will look at which natural things they are most thankful for. They will walk around the outdoor space, taking time to think about which things they are most thankful for and why. This activity works best when the students are working individually as it allows them to think about their own personal thoughts and feelings. It’s a great way for your students to gain a greater appreciation for the environment around them. This activity can lead onto nice discussions about how to care for the environment, thinking about what they can do locally to help.